Electric handheld planing devices are available in all shapes and sizes, and can handle most woodworking jobs from small to large. These machines are highly important for common construction tasks, such as stud work and refinishing. Handheld planers can also assist in the recovery of older wood through speedy stripping of previously-stained wood and squaring up of battered edging. Handheld planers are also incredibly compact, lightweight machines that allow woodworkers to climb ladders with ease, and need only one hand (instead of both) to perform tasks like planing down a window frame that might be a bit too tight for the port. A high-quality handheld planer is a highly accurate tool that any serious craftsman can utilize to make incredible, precision changes to their woodworking projects, from garden beds to entire homes. If you have the right equipment and a little know-how, you'll be able to turn hunks of wood into works of art on a par with Michelangelo's David. Doors become beveled masterpieces, cabinets as sound as the Bank of England, and countertops with endings so perfectly tapered that the Pet Shop Boys look on with envy. A power planer follows the same basic principle as your standard hand plane. The body rides on the sole plate (the metal slab at the bottom). The difference is that there are electric blades housed in the mechanism which rotate at very high speeds and make short work of any wood that gets in their way. The front hand grip also works to adjust the depth of the cuts. The gauge, using scale settings, turns forwards and backwards to move the front shoe of an electric tool down or up, setting the chosen thickness of the cut. Based on the thickness set in place, the planer eliminates plenty of timber, or not much at all. You'll learn by doing how best to position your hands and your body weight to get the results you want. If you are new to woodworking, it will take some practice to be able to properly fix a warped dining room tabletop, or to ideally taper wood trim to pinpoint accuracy. However, all that is really needed to product relatively accurate results is a strong electric planer and a bit of patience. Practice makes perfect, remember. But what does balance mean for planing? This is positioning yourself with your legs spread apart, in a position comfortable through the pass of the electric planer. Each pass calls for a combination of both pressure and balance. Start by resting the front of the electric planer level against the wood, not allowing the planer blade to actually touch the wood you are working on. Start up the planer, and let it reach its full working speed. At this point, slowly push the planer into contact with the work piece and push forward smoothly. Maintain pressure on the grip while the planer starts to touch the work piece. Balance your pressure between the handle and knob as both the front and back shoe come in contact with the work piece. As you guide the planer towards the end, catch the handle on the back to avoid over-reaching following a pass. The front can fall off and cause a bite to be taken out of the end by the blade. This is sometimes called a “snipe”. Those who have used electric handheld planers easily come to understand why woodworking and carpentry professionals refer to them as “buzzers”. These planers can get pretty high in volume, to the point where your ears can ring after extended use. However, quick work compared to manual single-blade planing makes the results and speed worth the noise. A typical, higher quality, beam-focused planer is the 1806B from Makita. It's wider, longer and stronger than most alternatives. As can be expected, it is expensive in comparison to other handheld planers. If you are seriously interested in working with wood, and wish to tackle massive jobs, however, this is the best workhorse. Cheaper, weak-powered, little planers struggle to reduce hardwoods properly, and can burn out easily. Additionally, it is more challenging to become accurate, flat, square wood with a little planer. On the other hand, for simple repairs around your home and ordinary tasks like adjusting cabinet doors and making shelves, a quality little planer is everything that you require. A moderate size Makita planer is an excellent tool for managing stud work and small tasks. 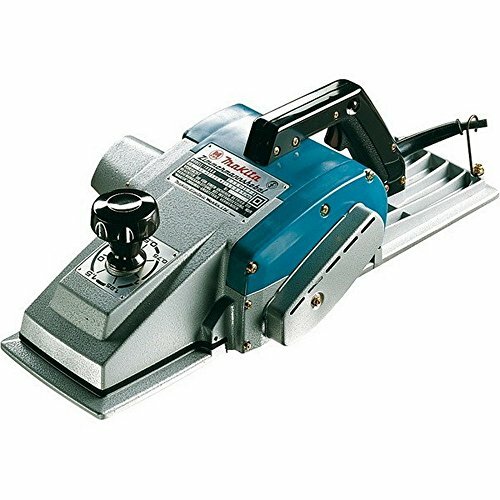 Curved Base Electric Planers: These planers will assist in creating arches or provide a 'rough-hewn' finish. 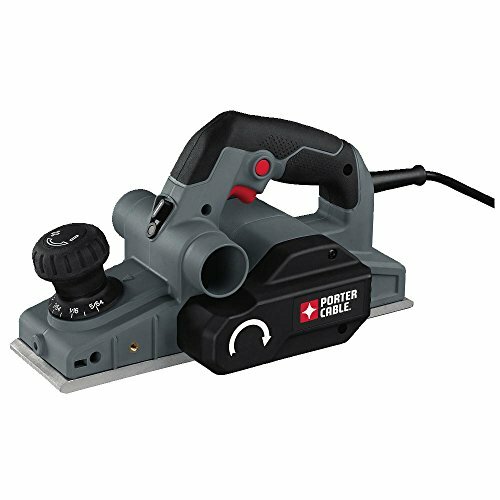 Corded Planers or Cordless Planers (rechargeable): There are instances when a cordless planer is useful, most notably for smaller jobs. They can really be helpful if you're working on a huge piece of property or large project and need to fix sheds, fences or any type of wooden structure far from a power socket. They may be an added advantage on a building site also when adding to overall mess with wires is only a nuisance. Fences: Any woodworker who has used a bench planer understands that they are fantastic tools for producing perfectly square wood with incredibly precise measurements. A handheld planer can perform a similar job if you have a well-managed fence. Woodworkers looking to get into electric handheld planing typically have two options for blades to choose from: Carbide and High-Speed Steel. Carbide blades come two-sided, slipping onto the cutting head of the planer, and are tightened into place firmly with a standard wrench. These carbide blades last far longer than their HSS alternatives. High-Speed Steel blades are sharpenable with a jig. This makes them a better value per dollar over time. This is particularly true when working with old wood that might contain debris or nails. Incredibly sharp HSS blades can provide a smoother finish as well. There are also some electric hand planers that contain two full sized blades. These blades generally need to be re-sharpened with a whetstone or similar sharpening device. Most planers use two double edged carbide blades that are disposable. Many planers also include plastic bases for the gauge, assisting in proper positioning of the blades and plate for planer drum mounting. Unplug the handheld electric planer until the blades are fully replaced, or finish making any repairs and alterations to the tool. Change blades once they reach the point where they produce smoke or wood grain powder as you are planing. Forcing the planer to continue its work when this event begins to occur can cause severe stress and harm to the motor. Re-sharpen or replace both blades simultaneously. This maintains cutter equilibrium and balance while guaranteeing quality cuts time after time. You don’t want one blade that is six months old and another that was changed the week prior. Blades which aren’t mounted directly on the cutter head can cause the planer to vibrate persistently. Thoroughly check bolts for tightness before carrying out any project using an electric handheld planer. Is it easy to rent a handheld planer? Buying a planer is a very simple task, but finding one to rent proves far more difficult. Most handheld power planers have blade widths of three and a quarter inches. Some have larger blades that are six inches or greater in width. Planers vary in cost due to overall variations in blade thickness, quality of construction, general power and accessories available. Lighter duty versions will handle most planing jobs at a minimal cost per project. Contractor quality planers are built to handle the elements better, have more precise and simpler thickness gauges, include quite a few additional accessories, and are priced a good bit higher than the lighter-duty versions performing similar tasks. As a first planer, for general purposes, this Porter-Cable model is the best. The cutter measures in 1/16-inch increments so fine work is simple to do. Grooves in the bottom plate allow you to create chamfers with ease, something that is not so simple with competing planers at similar price points. Additionally, there is a dust bag, but like all dust bags on power tools it can be tough to use in many circumstances. A face-mask is always suggested. This is the sort of planer I would use to cut down windows which were sticking and difficult to open or shut. It's lightweight and rugged but not so strong that you can't use it with one hand (with frequent use). It’s a powerful machine in a small package, and it is easily distinguishable from alternatives at a similar price point. The Bosch is a more sophisticated creature than the Porter Cable, and, at a slightly higher entry price, is worth considering if you are looking to do more precise planing work. One of the features that the Bosch 1594K is best known for is the efficient chip ejection procedure. Some machines clog on deeper passes or 'chatter' when planing, producing an uneven finish. 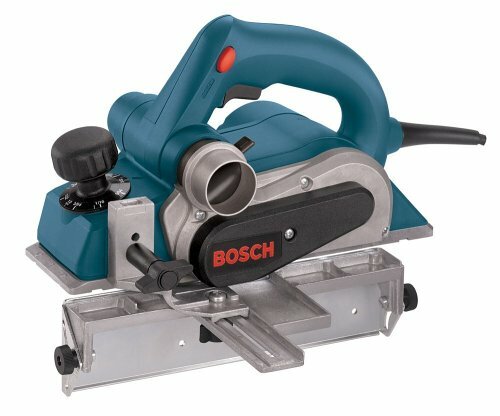 Alternatively, this Bosch will cut at maximum without difficulty. Additionally, it has that rare thing - a chip vacuum extractor adapter that does its job! Not many people will require a great brute of a planer like this one. They are great to use, however, and make light work of some critical construction jobs such as framing a house. For hobbyists, the excellent pleasure is using this system to airplane table tops or other broad pieces of timber. This machine has a working width of 6-3/4 inches and can make cuts as thin as 1/16-inch in one single pass. The fence is a lot more fancy than the Porter-Cable making this is a fantastic tool for all kinds of uses - from building boats to shaping a chair leg. Like all power tools, it is important for users to protect their eyes and hearing by wearing appropriate safety equipment. After turning the tool off, protect yourself and the work (and also the blades of the planer itself) by placing the front shoe of the planer up on a wood block or some type of prop while the spinning cutter head slows to a stop. Work safely over your head by putting walk boards between two ladders, in accord with the direction you're going to be making your cuts. Once your neighbors can see the rate and simplicity with which you utilize your planer, watch out! You'll need to start setting up a sign-out sheet to keep track of all of those borrowers who are looking for an efficient planer for their own home projects. A face-mask. Dust from boards manufactured with glues like MDF and plywood are especially harmful. Extension cables for corded buzzers. It might sound crazy, but it can useful to have a fan in your work room. Blow that dust away from you (and keep cool!). Better still is a dust extractor. Ear plugs or heavier duty ear protection.